Once upon a time you’d pitch a show to a TV channel and if they liked it they’d give you the cash upfront to make it and you’d take home a healthy 10%+ margin. Then along came the terms of trade, and in many cases producers not only took their 10%+ margin but also got to keep the programme, effectively granting the broadcaster a limited license to transmit a show they’d paid for. Once that license expired the producer could then sell that finished programme elsewhere without compensating the broadcaster, as well as selling the format rights for localised versions. It was certainly the good old days – the equivalent of running a factory where you sell all the inventory before you’ve made anything (plus a margin), work at 100% capacity, hand over the goods, and then, 2 years later your customers give you all the goods back to sell second hand – nice! Of course there’s only so long this can last, and a lot of very bloated incumbents are now seeing their business model challenged. Children’s TV adapted earlier than most, recognising the big money opportunities derived from merchandise and deficit funding against this future revenue. Then big budget drama producers increasingly sought co-funding across territories to get their work made, recognising the opportunity to make profit through sales and merchandise (books, DVDs, films, live experiences). Now it’s creeping into every genre, and like it or not any of us wanting to get our work out there need to be as creative with our business models as we are with our content. 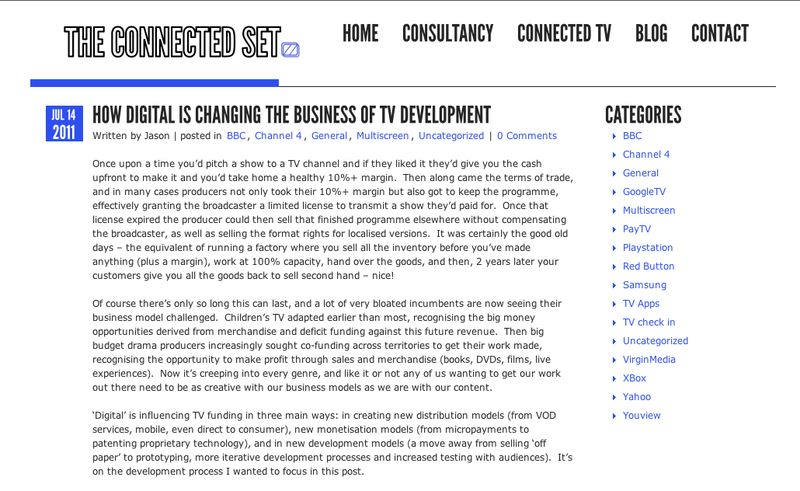 ‘Digital’ is influencing TV funding in three main ways: in creating new distribution models (from VOD services, mobile, even direct to consumer), new monetisation models (from micropayments to patenting proprietary technology), and in new development models (a move away from selling ‘off paper’ to prototyping, more iterative development processes and increased testing with audiences). It’s on the development process I wanted to focus in this post. Development is such a vital component of content businesses, and yet it wasn’t always such a formalised activity. 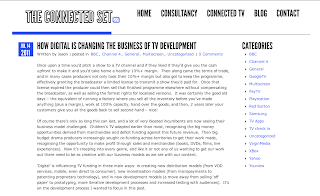 It was when independent producers came onto the scene, spurred on by the formation of Channel 4, that the game became much more about the quality of the idea, and the ‘development team’ came into existence – blue sky units dedicated to conceiving and researching the ideas for TV shows. Production companies would pitch these ideas off a sheet of A4 and then some would receive funding to develop their ideas in detail. A certain proportion of paid developments would lead to pilots, and some would be grenlit and eventually turned into a series. Money flowed from broadcaster into each stage, increasing in amount at each step, from paid development through to broadcast. Visit the web site to view the illustrations and read further.